Considering how popular the Nicodem article was, I wanted to keep this idea going. For those who are maybe new to the blog or didn’t see the previous Wanted Poster, the goal of these articles is to take a look at the archetypal “top tier” lists in the meta at any given moment. Malifaux’s a complex game with a lot of different models, and it’s impossible to know all of them in depth. So, the objective was to present the crews players should be looking out for if they’re attending tournaments at the top level. The articles will familiarize you with the crews and masters of the top lists, give you an idea of how they run, let you know what to watch out for, and give you an idea of how to beat them. And, since I’m just some shlub living in the Malifaux desert of Southwest Virginia, I would hunt up some top-level Malifaux players to contribute their knowledge with the community. When released in Wave 4, Sandeep Desai’s design/theme was pretty clear. He was intended to be an all-rounder: not the best at any particular thing, but pretty good at everything. I don’t know if this analogy still works, having not played any of the newer versions of the game, but he was supposed to be like Mario from Mario Kart. Not the fastest driver, not the heaviest hitter, but right in the middle. That’s what Sandeep was supposed to be. He could summon a little bit, but not to the extent that Nicodem or (at the time) Dreamer could do it. He had attacks that were ok, but nothing that set the world on fire. He had a little bit of mobility, and a bit of toughness. He would be a great starter master or a very solid choice for a single-master style tournament, but you would probably see others for the top-end games, simply because their ability to specialize would make it so a better choice would probably be available for most games. Then the first tournament he was legal (Gencon Masters), he won. That probably should have told us something. Fast-forward to 2018, and a very different state of affairs is in place. If you play against an Arcanist crew in most competitive settings, you need to expect to play against Sandeep regardless of the scenario. The All-Rounder has turned out to simply be the best choice in most games. They’ve almost become a one-master faction, as he can do almost any job in the game as well or better than any of the other masters. It’s not that the other Arcanist masters are bad, it’s just that he’s at least as good if not better for…just about everything. Ramos is a great summoner and Rasputina’s a great damage dealer, but their crews are usually on the slow side and can’t reposition efficiently. Marcus is fast and can use resources to hit hard, but the damage isn’t as reliable, and he and his beasts can be a bit fragile. Ironsides doesn’t have the speed or ranged projection. And Kaeris…well, she’s Kaeris. And, even if you get a game with a pure enough scheme pool that you can specialize with one master so completely that it makes them a better choice than Sandeep, he’s still likely to be a close second, and there’s something to be said for focusing on one crew to the point of mastering it rather than switching between very different pools of models to use for different games. So what makes Sandeep such a solid choice in most games? What is it about him that makes him such a solid choice in most games? Well, I don’t know. I’m an idiot. That’s why I contacted Ben Sime, host of Arcane Reservoir and long-time Sandeep player, and Erik Lodal, better known as Grrn, an American Sandeep expert and occasional guest on the Max Value podcast. We’ll start by taking a look at some characteristic elements of Sandeep’s crew, right after this word regarding our Patreon account. Do you know that we’re supported by Patreon? You should, I mention it every week. But, in case you’re new, here’s the deal. I’m not rich. I’d like to be, but I’m not. I also don’t have an excess of free time, and what I do have I dedicate in large part to writing this blog. I’m not asking for sympathy…I’m just asking for a little bit of money. $1 a month, to be precise. For $1 a month (.25c a blog post, in most months) you can be a part of making Malifaux Musings into the world’s premiere Malifaux information source. We discuss tactics. We discuss model releases. We discuss fluff. And, if we get enough new donors, we’ll start to have our monthly raffles for Limited Edition Malifaux stuff again. You can’t beat that. So why not throw us a shekel or two? Just head over to patreon.com/malifauxmusings and donate today! As stated, Sandeep doesn’t immediately jump out at you as a world-beater. His stats aren’t bad, but they’re not amazing for a master either. None really stands out other than his 12 wounds, and even that is starting to become par for the course (for context, he was smack in the middle for number of wounds in Book 4, where he was introduced.) Impossible to Wound and Arcane Shield gives him some survivability, and he has good mobility tricks to get him out of tough situations. As Grrn put it, most Sandeep deaths are due to player error, rather than the opponent doing something clever. However, he has a completely forgettable melee attack, a decent ranged cast with a 2/4/5 damage flip that can use a Ram to get a + to damage, and some utility actions to push things towards him, give him a (0) action Leap, and/or to interact as a (0). He’s very vanilla, so what makes him so great? The first things are his Beacon and Student of All abilities. Beacon lets other friendly non-peon models within 12” and LoS use his cast actions. They can each only be used once per turn, but this effectively gives Sandeep a potential for 2 extra (1) actions, as well as spreading around the use of his (0)s as well. Better, the spells are cast by the other members of the crew, creating the potential for force projection. Cast 6 2/4/5 is an ok attack for a master, but for a 4 soulstone gamin it’s pretty solid, even at -1 Ca! Second, Sandeep can take a free (1) action after one of his crew uses his CA actions and ends with a tome in the final duel total (once per turn.) That’s like an out-of-turn Fast, in exchange for doing what you want to do anyways, borrow Sandeep’s spells. He has 4 Ca actions on his card, so chances are you would get the free AP every turn just from flips, even without Arcane Storm having a Tome built in! Next, and possibly the thing for which he is most infamous, is Deep’s summoning. It isn’t built in, instead coming from his Limited Upgrades (other than the Book 5 one, but most don’t give that one much love.) Both allow him to summon gamin, including his totem Banasuva, while attaching one of three Rare 1 upgrades that give them a buff in exchange for a hindrance of some kind. Thus, he’s only ever able to have at most 3 summons in play at a time (a system some have advocated adapting for all of the summoning masters in the game, though that’s neither here nor there.) The two flavors of his Limited favor either scheme running/interacting (To Behold Another World) or combat (To Command Another Plane.) Opinions fluctuate on which of these are better, though both Ben and Grrn prefer Behold. Both have their merits. One of the upgrades from Commands hands out + to attacks for friendly models within 3, which you can summon wherever you need it. A mobile + to attack bubble is pretty handy, as most Nicodem players could tell you. On the other hand, Behold Another World has the utility of a model that can drop scheme markers on the turn it is summoned or another that comes in with a weak version of Chatty is often more important. Probably best to try both and see which you prefer. As for what they’re summoning, well, the answer is usually Wind Gamin. Their speed and the flurry of attacks they can unleash outclasses most of what the others can do. Of course, Banasuva is a Gamin, so you can summon him, but that can be pretty card intensive. Some of the others can be useful as well for certain situations, but he Wind Gamin are really what you need to look out for. Maybe another upgrade as you like it? Part of his major strength is you don't really need other models for him to do his thing and do it well. I think a typical Sandeep list is going to include mages, some smaller models such as wind gamin for schemes, a big hitter in Howard or the Valedictorian. Then finishing off with something like either a Practiced Production user and/or these days Kandara. How it plays is always dependent on build, scheme pool etc. but typically some nice synergy between the academics getting the most out of the Oxfordians. Little things running objectives and taking advantage of borrowing Sandeep's (0) interact, while another probably uses the arcane storm. If these models aren't in it'll typically be the summoned ones that can take advantage. A Mage list will probably see "Commands" making a fully powered Oxfordian weapons battery whilst a "Visions" list is taking full advantage of the expendable nature of some of the gamin. Other than that, expect little suprises, things like Sandeep getting his free AP via Student of All to summon out of activation and other nice little things. Sandeep crews often bring the Oxfordian Mages, because their new discount upgrades and the old wards turn them into a 15 stone hard-hitting, furious casting, tough to kill unit. Usually you see something Tanky like Carlos Vasquez, maybe a hard hitter like Howard Langston. The new hotness is to spam Slate Ridge Maulers for their toughness and ability to spam Slow, though the jury is out on whether that build will have staying power or if it’s just a meme list. This is probably the hardest part of this article, and the thing that I’ve struggled with the most (outside of fighting off a bout of writer’s block) when putting this thing together. I really don’t want to write “play the schemes and strats, and do it better than your opponent,” but that’s really what it comes down to. There are no glaring weaknesses in Sandeep’s game. He doesn’t have a hole in his swing. And, moreover, there’s no formula for what his crews bring to the table. If you tech to kill the Mages and play against Ben, that tech is worthless since he doesn’t use them. To beat him, you have to try and be as flexible as him and play the game to the bets of your ability. Let’s see if our contributors have any other tips. Ben) The main anti-Sandeep thing I can think of is the same case for a fair few masters and that is to pressure them and their resources. Sandeep is Impossible to Wound but he's easy enough to hit. Resource wise it's just the hand he needs but to take advantage of 'deep and his crew there's discards, 12's for Banasuva and 8's for other gamin. On top of this there's Furious Casting in the mage list which can be aided with the Unalligned Sage upgrade but that's a cost in itself or even stuff in my own lists like Flurry from Howard and healing from Carlos. A few cards down and it's a much harder time for him. Also, it's maybe cliche but anti armour is decent vs Sandeep too, the little gamin all have armour and you're bound to see something else with it. It isn't a major deal but if that's your decider for the last model in your list vs Sandeep lean towards it. So discard can be useful against him. That’s a good tip. What about Grrn? Grrn) Sandeep has a lot of Ca actions. Sue is pretty decent into him. Things that ignore damage reduction and can smoke the Oxfordians are also worth considering. I think another part of what makes Sandeep really good is that there's no "oh well you took the counter model, I guess I lose" thing going on. In general you have to play Sandeep's game and beat him at it. So Sue to disrupt casting and anti-armor. Probably a good idea against Arcanists in general (he said, right before playing Ironsides). And a reiteration that there is no catch-all solution. After my interview with Jamie, I’ve started asking players what they would bring to a game if they were playing against their Doppleganger who was bringing their list to play against them. When I asked the fellas this question regarding their Sandeep crews, this was what they had to offer. Ben) I think the strats and schemes will always matter, I think luck is still always a factor but overall it's the player not the crew usually. Versus my kind of list if I have to answer though I guess it would be any of the top summoners, obviously Nicodem is up there, but even solid Som'er crews.Whilst Sandeep summons his crew can't get beyond a certain size, even with Kandara upgrade shenangians. The others can press the numbers advantage and get activation control which is not only one of the most important things in the game full stop but vs my interact shenanigans it's even more of a pain. Grrn) Hah, yea I've actually done this a few times. Well that's complicated. First, I think Sue is a good consideration. Past that I have several branches of thought. I would definitely not take models that rely on armor and/or are slow as mages are common. I would also try to take more models rather than fewer as activation control is a big, big deal. Cards are going to be fairly important in the matchup, so either looking at really efficient models or models that put pressure on cards would be another consideration. I have run a December Acolyte/Silent One gunline out of Sandeep in the mirror that worked out meh I guess? The biggest single factor in what crew I took would be the strat/schemes though, so it’s kind of hard to answer from just a general point of view. There's no one model I'd always consider. So, it seems there are some tricks that might help you. Pressure his resources. Bring some anti-caster tech, and things to help you deal with Oxfordian Mages. Don’t get out-activated if you can, obviously. And play the objectives more effectively than he can. That might be the most important bit, looking at the game and trying to figure what the rest of the crew will look like, and moving to counter that. Sandeep is a known commodity, but But the main thing is to know what to expect and be ready for it. Probably the best thing you can do to learn to beat Sandeep is play against him, so you can see his tricks first hand and know what to expect. Summoning a gamin that can interact that turn during a different model’s activation is tough to prepare for, but you’ll have a better shot at seeing it coming if you’ve seen it before. Practice, practice, practice, and be ready to play your game. Until next time, Musers. 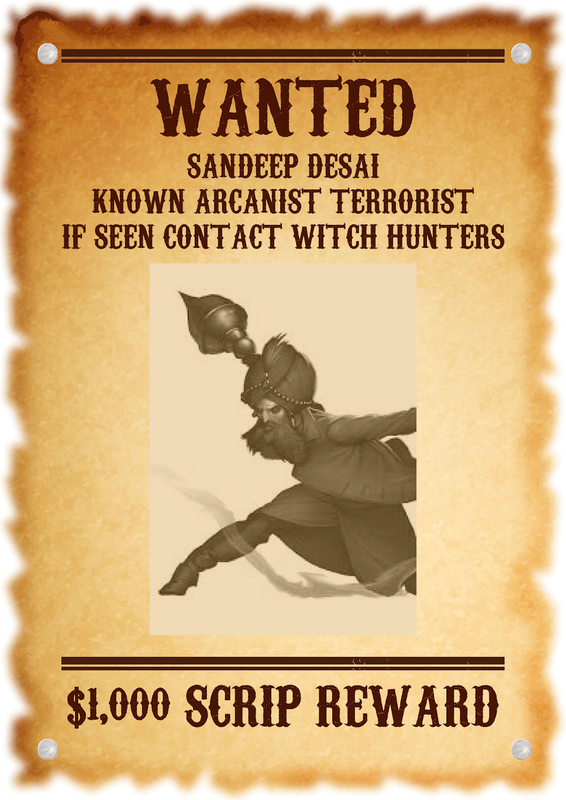 Remain vigilant for Arcanist terrorism. Keep an eye out for Wind Gamin. And play your friggin' stats and schemes, already! For more from Ben, check out his work at ArcaneReservoir.com and the Arcane Reservoir podcast. For more from Grrn, check out old episodes of Max Value.